x-nano™ MICR Black 1G is a High-Density Magnetic Nano Pigmented Ink specifically formulated for high-speed industrial and commercial specialty print systems (SPS) using TIJ 2.5 HP SPS print cartridges. This high-density formula ensures superior MICR signal strength (100% and above at 600dpi and 24lb porous MOCR paper) with top-quality high-speed printing of documents, tickets, labels, tags, packaging, certificates, checks, and more. 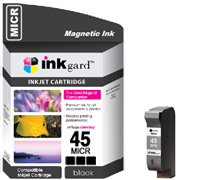 Enhance your high-speed industrial printer with MICR printing capability using the x-nano MICR Black HP45MX-1G Industrial Ink Cartridge - compatible with all HP SPS TIJ 2.5 printing solutions. Ideal for high-speed Industrial Printing, the x-nano MICR Black HP45MX-1G Industrial Ink Cartridge is specifically designed to maintain the required drop-size, viscosity, surface tension, and density for high-quality industrial & commercial printing. Print 100% MICR complaint checks that can be accepted and processed worldwide! When exposed to a magnetic field, x-nano™ transforms into distinctive geometric shapes such as cones and spikes. The unique magnetic properties of x-nano™ ink allow user to print MICR (Magnetic Ink Character Recognition) compliant checks in E-13B, CMC7. These special fonts encoded with MICR ink are required for high-speed sorting, processing, security print patterns and content for authentication. MICR inks are in wide use today by industrial and commercial users of high-speed inkjet presses, at home and at the office using desktop inkjet printers. Almost every currently available inkjet printer, All-In-One and fax machines can be equipped with MICR ink cartridges to print bank compliant, long lasting documents for archival, security applications, payments and premium quality photos. Save Money - Printing checks on-demand with x-nano™ MICR Ink is much more cost-effective than purchasing expensive pre-printed checks. Save Ink - x-nano’s droplet size reduces ink use up to 20%, while producing smooth and saturated output appearance. Save Time - Printing with x-nano™ MICR Ink allow for on-demand instant printing of MICR compliant checks. Ultra-Durable - Resistant to fading, smearing, and chemical alterations. Unaffected by extended light exposure and chemical alteration. Documents, images and checks printed with x-nano™ are virtually everlasting and durable against organic and inorganic solvents.